but lets start with a little history and add the aftermarket ( Drag-Racing ) info . case C4AW-4025-C may also be a large bearing single ribbed case. * Why do 35-spline shafts require a 3.250” bore case? 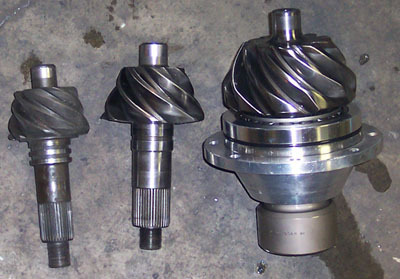 When upgrading to a 35-spline shaft, in a 9”Ford, it is necessary to increase the case bore size to3.250” in order for the carrier (locker/spool) to have enough strength at the bearing journal. When a 35-spline spool is designed to fit into a 3.0625” or 2.891” bore case, the bearing journal thickness is extremely thin- inevitably resulting in distortion or failure at the bearing journal. In addition, a vehicle that requires a 35-spline shaft is bound to break an OEM case (2.891”/3.0625” bore), leaving you to purchase another case while being stuck with a substantially weaker spool. We could easily use a 35-spline spool that would fit into a stock bore case; however, our goal is to find the best solution for our customers the first time, which will save you time, money and grief in the long run. Large Pinion Ball Bearing (35 spline) 1.875" 1.5 "
Large Pinion Custom (35 spline) 1.875" 1.5 "
Daytona pinion supports are found in conjunction with N cases, they have the same size outer bearing as the standards supports, but the inner bearing is much larger, and the inner webbing much stronger. 9" large pinion (not stock) , 10" and 12"
Pro gears are made from 9310 and then heat treated. It is a softer alloy than the 8620 Street gears. The softer 9310 alloy allows the gear to absorb higher impact loads that are generated in drag racing without developing cracks. A harder 8620 street gear could shatter under the same loads. As a side effect the "Pro" gears are not the best choice for street use as they will wear faster. Also available in the "Pro" gears is a large pinion with a 35 spline shaft for high powered applications. 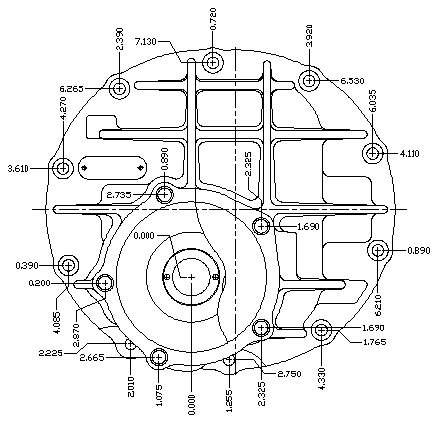 This requires a bearing change in the pinion support as well as a 35 spline pinion yoke. Gears termed 9-1/2" are also available for the 9" thirdmember. They offer a slight strength advantage over a standard 9" gear. - strange sells a spacer assy to use a 10 inch gear in a ultra case. "My friend has a 10-bolt rear with 28 spline axles etc... and he has run for years and never broke anything"
Or, imagine if you take your rear end in a vise and get your buddies over ... or even tie the other end to a horse ... pull as hard as you can ...any deflection ? .... You need to visualize what is going on. We are not only trying to get down the track safely but quickly ... Spend your money wisely! 5/8" wheel studs are stiffer than 1/2"
or drive shaft , or transmission ... A consistent 10 second bracket car becomes a nightmare 9 second car. They appear to have come in the larger Lincoln and Mercury vehicles. for the wider gear and the gasket for the 9 3/8" is used (bolt pattern is supposedly the same). Flange Axle Design - The most common flange axle design has a single piece axle, flange and shaft. The axle bearing has a press fit on to the axle shaft and a bearing lock ring is then pressed on behind the bearing. Housing ends are welded to the housing tube and the bearing slips into the housing end. The bearing is then retained by the caliper mounting bracket. Wheel studs are installed in the flange of the axle where the wheel bolts directly to the outside of the axle flange. With this design the axle and axle bearings must support not only the vehicle’s weight and torsional loads, but also the bending loads from acceleration (rear wheels try to “toe-in” during acceleration). Safety - In the event of an axle failure the axle along with the wheel and tire can separate from the vehicle. In the case of a break outboard of the bearing, the wheel will definitely come off. A break inboard of the bearing and the wheel will stay on only until the caliper mount breaks and the bearing is free to come out of the housing end. This will also take out the rear brakes and the caliper and brake lines will be torn off. Safety - In the event of an axle failure the wheel and tire will remain with the vehicle (as stated earlier the axle is independent of the flange and hub which are mounted on the floater spindle). The rear brakes would not be affected by axle breakage. Live Axle Design - With this design the axle shaft is a large diameter, thin wall tube and becomes more of a structural member. The shaft is splined in the center to engage the spool and splined on both ends to accept a splined flange on each end. Both ends have a threaded area for the flange retaining nut. Most live axles use a single tapered roller bearing on each end, which must be preloaded with the flange retaining nuts during assembly. 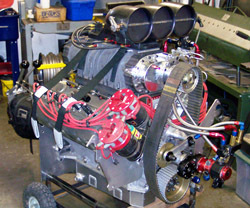 This design is most commonly found in Top Fuel car applications. Note: The above information primarily addresses strength. Generally speaking, wear is not a main concern on Drag race vehicles because of their low mileage. Our main concern after safety is stiffness. Example: If you have a larger spline axle (think diameter), the number of splines is usually not a concern. The strength of a 35 or 40 spline would not be a problem. However, the twisting of a larger diameter shaft will be less and result in a quicker accelerating car. 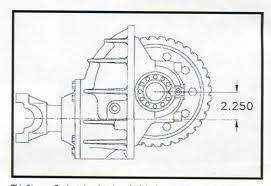 The axle may weigh more unless it is gun drilled which removes material from inside the axle. ford 9" and 8" = 2.25"
chevy 12 bolt = 1.5"